Thanks to fanboy uproar, the first Ghostbusters figure to feature the Slime Blower, Winston Zeddemore, received a brand-new, SB-accurate, torso sculpt instead of recycling the previous, Proton Pack-specific upper body. Let's take a look at how he turned out and whether or not Mattel was able to silence THIS fanboy. Just in case you haven't already noticed, Mattel created a third WWE collector line that actually replaces the WWE Entrance Greats series that debuted last year with the launch of WWE figures. The new line dubbed "WWE Defining Moments" enchances the EG figures by adding Elite/Legends-style articulation. Since it's debut just before the start of 2011, Mattel has released 4 waves with two figures each. Today we're taking a look at one of the most anticipated and fantastically executed releases so far, Ricky "The Dragon" Steamboat. I didn't want all the Green Lantern coverage to be based solely on movie figures, so I dove into the storage bins and pulled out this little gem. It's Green Lantern (Hal Jordan, of course) from Toy Biz' 1990 DC Comics Super Heroes action figure line. While this line was plagued with quality control issues, it helped pave the way for Toy Biz' later successes with the Marvel Comics license. DCCSH holds a special place in my heart because it (along with the main-line based on Tim Burton's 1989 Batman film) was my introduction to the world of superhero action figures. Let's see what this version of Hal has to offer! The Green Lanterns are coming! The Green Lanterns are coming! Yes, sir! We're less than a week away from the feature film debut of Green Lantern and the Hive's in full swing! This month's display is a rollover from last month with a primarily GL-theme. I rearranged the main displays and have an all-new line-up on the wall shelves. So swarm on over and check out June's action figure display! Back in March, Mattel released a series of action figure two-packs pitting current and former WWE Superstars (from WWE Elite Collection and WWE Legends, respectively) against each other. These packs were meant as a tie-in to the WWE All-Stars videogame and to-date contain only 1 wave of two-packs. Here's a look at one of the sets featuring two popular grapplers. Sure, this review is really late, but I know you're dying to read my opinion of this DCU two-pack! Right? 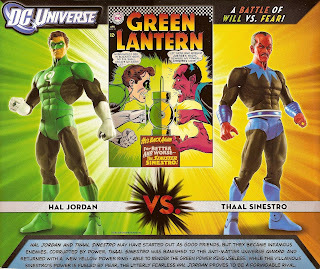 If you're a DCUC collector you know Mattel has mishandled the line's Sinestro figures since the beginning. 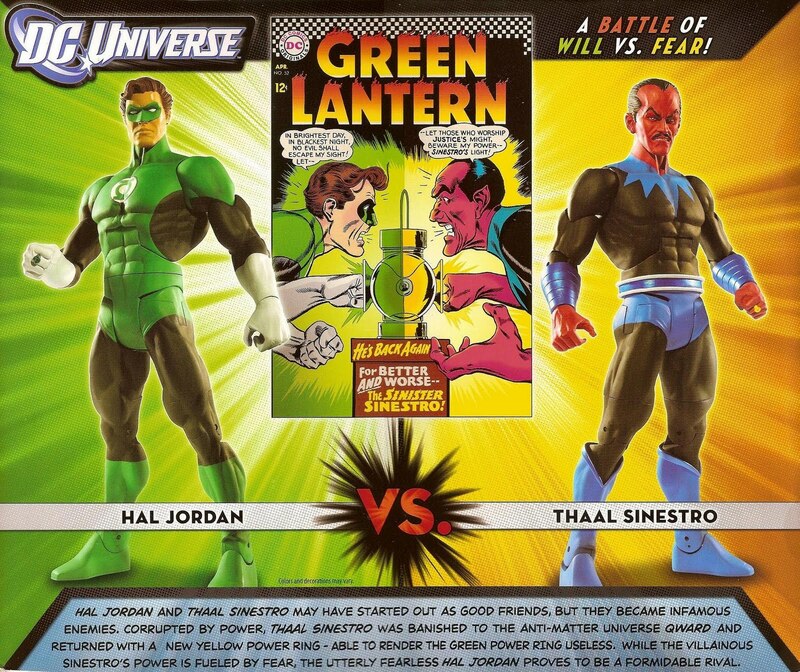 However, with the arrival of this set, Matty claims to have finally "corrected" Sinestro. Does that statement hold true, or is this yet another failed attempt at a 6" version of the savior of Korugar?